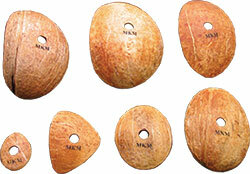 Description MKM CocoRibs are made from coconut shells. CocoRibs are tough and their ergonomic shape and natural curves make them very suitable for both throwing and handbuilding. The ribs have been soaked in mineral oil. Natural variation : Some of the CocoRibs are made from younger coconuts, in which case the shell will be lighter in color and somewhat thinner, and some are made from older coconuts, in which case the shell will be darker and somewhat thicker. The size of the coconut may also vary, resulting in ribs that have sharper or less sharp curves. And because the meat of the coconut is removed, in many cases by hand with a knife, the interior of the CocoRib may be marked or scratched. All these represent the natural variation of the material used to make these ribs, and should not affect the performance of the rib in any way.